↑ "Definition of Himalayas". Oxford Dictionaries Online. http://oxforddictionaries.com/view/entry/m_en_gb0378930#m_en_gb0378930। আহৰণ কৰা হৈছে: 2011-05-09. ↑ "Definition of Himalayas". Free Online Encyclopedia. http://encyclopedia2.thefreedictionary.com/Himalayas। আহৰণ কৰা হৈছে: 2011-05-09. ↑ Yang, Qinye (2004). Himalayan Mountain System. ISBN 978-7-5085-0665-4. http://books.google.com/?id=4q_XoMACOxkC&pg=PA25&lpg=PA23&dq=%22South+Tibet+Valley%22। আহৰণ কৰা হৈছে: 2007-08-07. ↑ Kala, Chandra Prakash Kala (2011). Medicinal Plants and Sustainable Development. প্ৰকাশক New York: Nova Science Publishers. পৃষ্ঠা. 280. ISBN 9781617619427. ↑ Kala, C.P. (2012). Biodiversity, Communities and Climate Change. প্ৰকাশক New Delhi: Teri Publications. পৃষ্ঠা. 358. ↑ "Sunderbans the world’s largest delta". gits4u.com. http://www.gits4u.com/wb/wb6a.htm. ↑ Drews, Carl. Highest Lake in the World "Highest Lake in the World". http://www.highestlake.com/highest-lake-world.html%7CThe Highest Lake in the World। আহৰণ কৰা হৈছে: 2010-11-14. ↑ Devitt, Terry (3 May 2001). 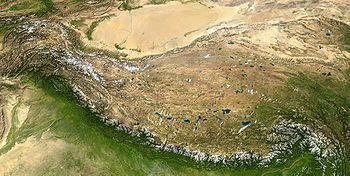 "Climate shift linked to rise of Himalayas, Tibetan Plateau". University of Wisconsin–Madison News. http://www.news.wisc.edu/6138। আহৰণ কৰা হৈছে: 1 November 2011. ↑ Gravgaard, Anna-Katarina (2009-12-13). "Nepalis note climate change". Global Post. http://www.globalpost.com/dispatch/asia/091208/nepal-glaciers-climate-change. ↑ Pommaret, Francoise (2006). Bhutan Himlayan Mountains Kingdom (5th edition). Odyssey Books and Guides. পৃষ্ঠা. 136–7. ↑ Tibetan monks: A controlled life. BBC News. March 20, 2008. ↑ Mosques in Lhasa, Tibet. People's Daily Online. October 27, 2005. ‘The Mighty Himalaya: A Fragile Heritage,’ National Geographic, 174:624-631 (November 1988).